My first view of Monte Corvo was from the west, on a cold winter’s day in January. Edita and I had slogged our way up Monte San Franco, a gentle grassy ridge that looked easy from the contours on the map. It was a windy day, but there were only pockets of snow, and no need for the ice axes we had brought with us. For the most part we were walking in cloud, and when we reached the iron cross that marked the summit the wind was severe. With little in the way of a view, we were ready to turn around when the clouds parted to reveal a line of snow-capped peaks disappearing into the east. We discovered later that we had been looking at Gran Sasso’s big three: Monte Corvo (2623m), Pizzo d’Intermesoli (2635m) and Corno Grande (2912m). 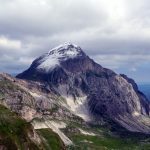 Closest to us had been Monte Corvo, a giant bulk of a mountain resembling a triangular prism, with a peak at either end, linked by a long summit ridge. 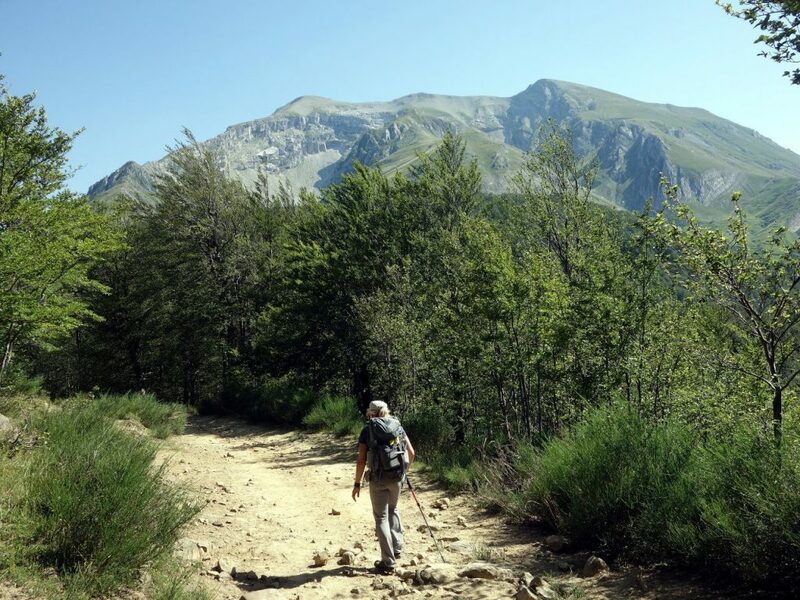 It looked to be the easiest of the three, but for the next few months Corno Grande absorbed our attention, being not only the highest peak in the Gran Sasso massif, but the whole of the Apennines. 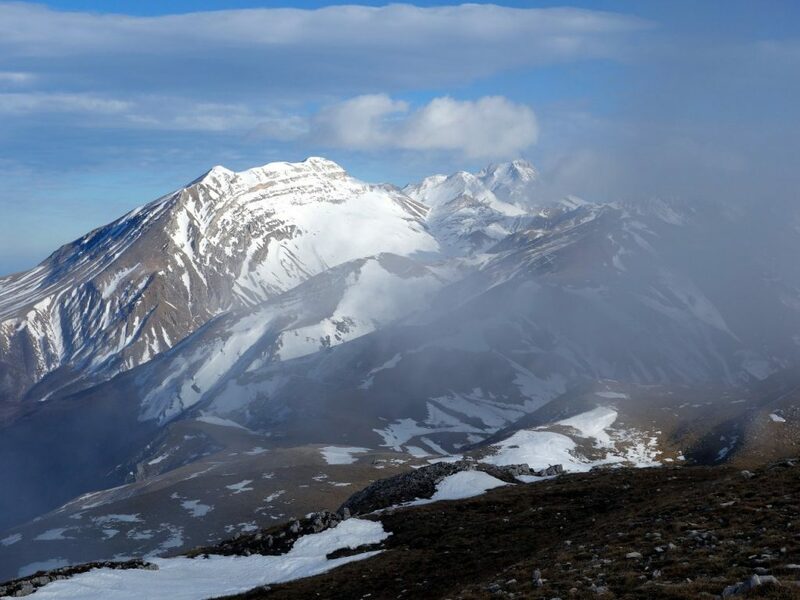 It took not one, not two, but three attempts for us to reach the summit, and in the meantime Monte Corvo (or to give it its English translation, Crow Mountain) lay forgotten about. I talked about our ascents of Pizzo d’Intermesoli, the second of the trio, last month. The two peaks are adjacent to one another, but divided by a deep valley, the Valle Venaquaro. We manage to reach the top of both on the same weekend in July. Like Pizzo d’Intermesoli, it took us two attempts to get up Monte Corvo. I moved to Rome in March and we made our first attempt on Monte Corvo the same weekend. There was still lots of snow on the ground, and we underestimated the time it would take in those conditions. We started out from Lago della Provvidenza, a small reservoir at an altitude of 1050m on the road to the west. It’s a long walk in from that side, along the forested Val Chiarino. We made good progress to begin with, rising gradually along a 4WD track. After an hour or so of we reached the treeline and the valley widened out. We found ourselves in a broad plain, the Piano del Castrato, surrounded by a ring of mountains (if you’re wondering how it came by such an eye-watering name, as well as being a singer with a couple of things missing castrato is another word for a bullock). At this point the going became more difficult. The treeline coincided with the snowline, and the snow became deep very quickly. We were the first to come this way since fresh snowfall, and there were no footprints to follow. 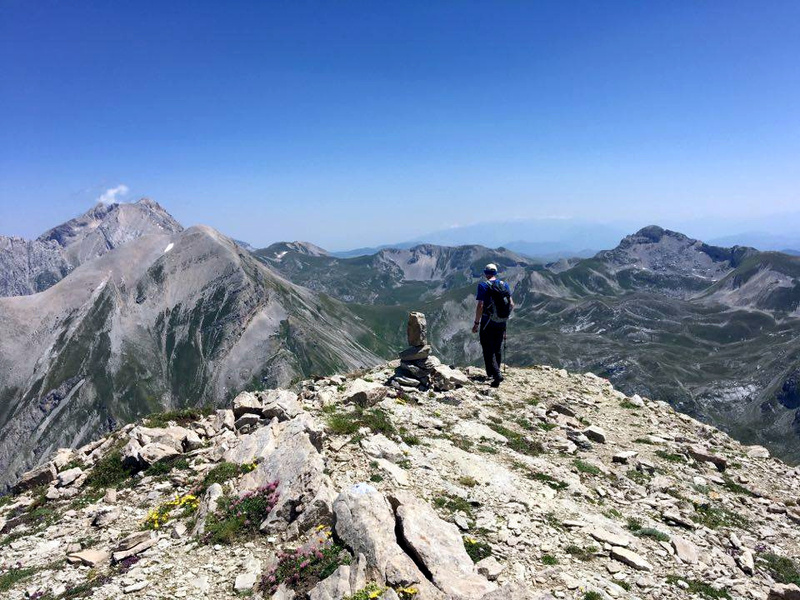 The sky was clear, and there was an obvious col to aim for beneath Monte Corvo’s southeast ridgeline, but the mountain still towered more than a thousand metres above us. We had to invent a trail through deep snow. It was soft powder, not easy conditions in which to make progress. A couple of times we had to traverse hillsides to avoid the risk of powder avalanches in the gully ahead of us. We ascended slowly, stopping for frequent breathers. It was obvious we weren’t going to reach the summit, and we revised our target to the col. 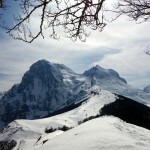 This was the Sella Venaquaro, and we reached it in the middle of the afternoon. Pizzo d’Intermesoli and Corno Grande appeared in front of us. The former was almost completely white with only a few streaks of grey rock. To the north Monte Corvo still rose another 400m above us. The summit appeared to be guarded by a vertical rock band, but the map showed a trail, so there must have been a way through it. It was now much too late to reach the summit and return before dark. 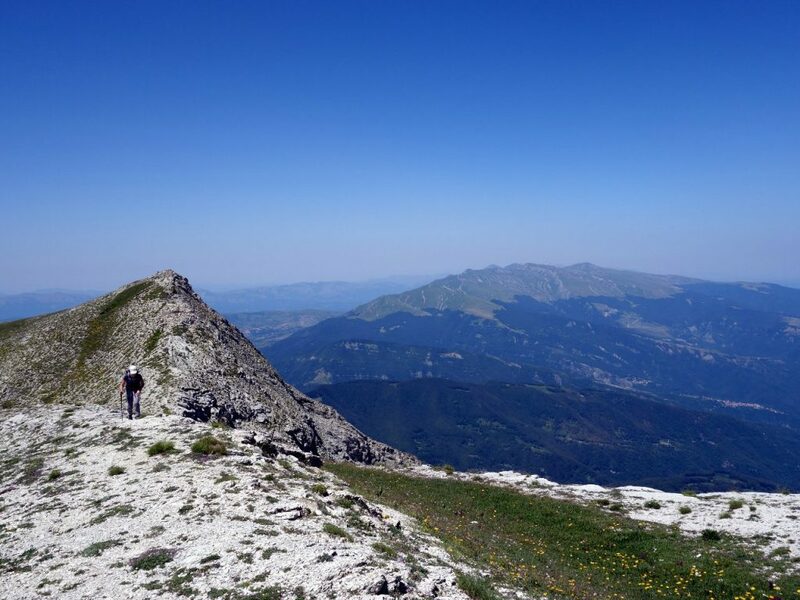 We knew we could return in the summer and complete this ascent very easily on rock, so we contented ourselves with climbing 2300m Cima Falasca, which rose above the southern side of Sella Venaquaro. We were quite happy with this. It was a crisp spring day, but it was still winter up here in this wonderland of snow-capped peaks. It had been great exercise and we still had a long walk back to the car. 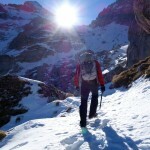 We returned to Monte Corvo in July, when the snow had all gone. On the north side there is an old ski resort, Prato Selva, in a clearing at one end of a forested ridge. 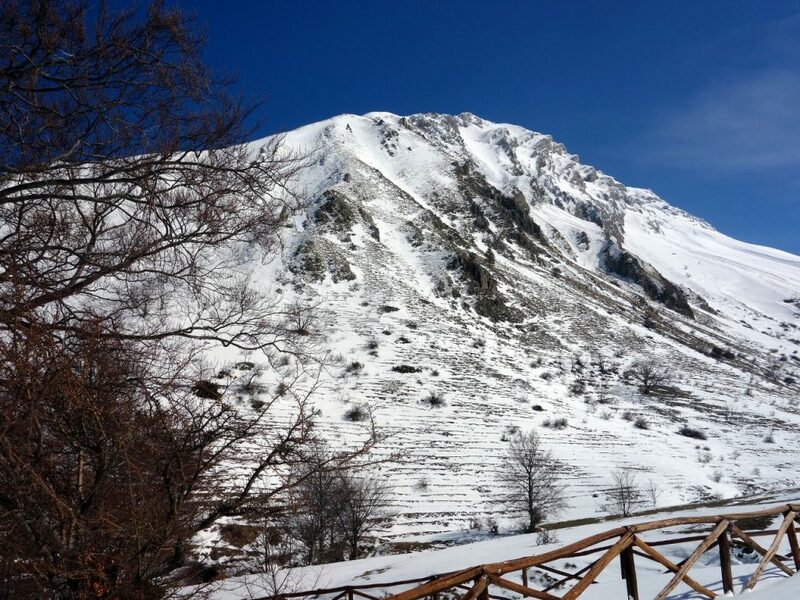 Like many ski resorts in the Apennines, where snow conditions are erratic, it’s been in decline for years, but unlike many of the others, this one has been given a new lease of life. It’s been converted into a bike park. Cyclists get taken up in the cable car with their bikes, but instead of zooming down one of the old ski runs, they speed down some of the trails through the forest back to Prato Selva. It’s a great idea. The place is doing good business, and there were many other vehicles in the car park when we arrived. But there’s just one problem: nobody has thought to tell the hikers like us. Our map indicated an obvious paint marked trail up through the forest, so like everywhere else, we expected a clear signpost at Prato Selva to start us on our way. There was nothing, and we wasted about twenty minutes trying to find the footpath. We eventually discovered it disappearing into the forest at the top end of a grassy hillside. We were still a bit confused though. It was exactly where it was supposed to be according to the map, but there were none of the telltale red and white paint marks that we are used to seeing on tree trunks. Still, the path was obvious, very well worn and we started up it. There was no paint, but we were clearly going in the right direction, so we continued up it for quite some distance until it joined another track. It was only on the way down again that we learned the truth. This was no longer a footpath but a cycle track. I discovered this in somewhat alarming fashion when Edita cried out behind me. I turned round, and just had time to jump off the trail before a cyclist hurtled past me at four hundred million miles an hour. A few minutes later the same thing happened again. This time, as well as a swish of air and the smell of burning rubber, the forest echoed with a volley of vernacular Italian as the cyclist whizzed by spewing out a torrent of expletives. We descended nervously for a few more minutes, looking behind us at regular intervals. Then Edita noticed another trail running beneath the cable car a short distance to our right. This was the new walking trail, complete with paint marks. We descended in safety for the rest of the way, but when we reached the car park I was annoyed to notice there was no signpost to mark the trail for walkers. It wasn’t that we hadn’t spotted it on the way up; it didn’t exist. It would be so easy for the owners of the bike park to erect one of these, and a good many arguments between walkers and cyclists could be avoided, as well as a few accidents. This wasn’t the only part of our ascent of Monte Corvo from the north side where we inadvertently diverted from the main trail. It was a Sunday, which is the day most Italians go walking (I don’t know what they do on Saturdays, but the trails are always much quieter on a Saturday). We emerged from forest at 1800m. Monte Corvo’s main summit ridge runs from east to west, and we were looking directly at it from the north. There was an obvious grassy spur leading up to the lower west peak. Walking groups are popular here, and there was a group of ten people heading up the spur to the summit. The sky was clear and the route looked obvious, so I put the map away and we followed them. Had I studied the map closely I would have noticed they were taking a massive shortcut that chopped off one side of a triangle. There was no trail up this northern spur, and it was hard going, over 600m of ascent up steep, tufted grassland. The distance was foreshortened. For much of those 600m we stared at the skyline above us, and it never seemed to get any closer. Towards the top the grass thinned into fine gravel, and the terrain became significantly steeper. I yearned to reach the skyline so that we could at least gain some encouragement by seeing the trail ahead of us. When we finally reached it I was pleasantly surprised to see a cairn about ten metres away. We had emerged almost exactly on the 2533m west summit. We were at the western end of the Gran Sasso massif. The two arms of Lago di Campotosto, one of the biggest lakes in the Apennines, lay below us. To the north of it rose Monti della Laga, capped by 2458m Monte Gorzano, the highest point in Lazio. High as it is, the whole range looked innocuous from this angle, a gently sloping hillside of green; nothing very noteworthy. The other side of it, just a short distance away, was Amatrice, the town that was destined to be devastated by an earthquake just a month later, killing 300 people. 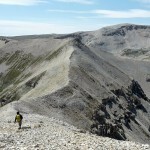 For the next half hour we walked along Monte Corvo’s bare summit ridge to the main summit. Far below us to the right was Piano del Castrato, the place we had waded through in the snow a few months earlier. Ahead of us a helicopter hovered over Pizzo Cefalone and landed on the summit. 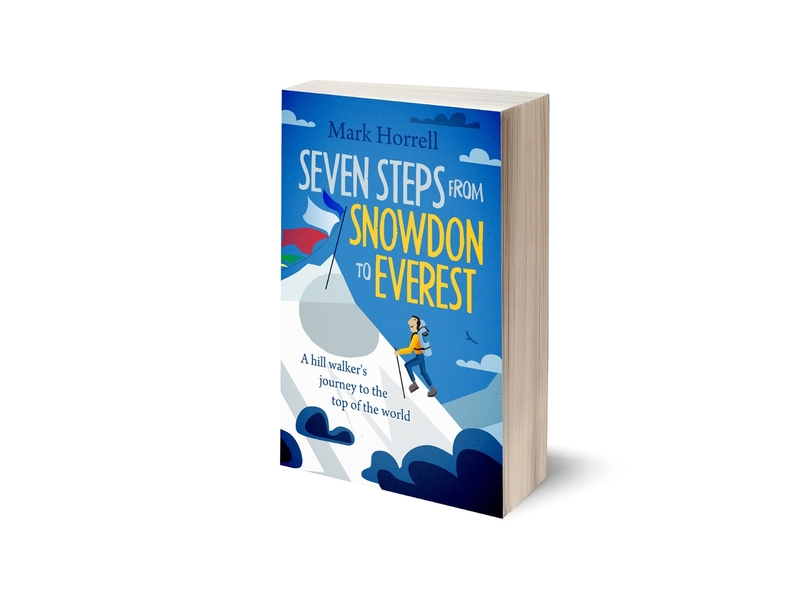 We had climbed this peak a couple of weeks earlier and endured a slightly hairy scramble back down its north ridge. It wasn’t especially difficult, but it was very exposed, and not the sort of place you would want to have an accident. The 2623m main summit of Monte Corvo was busy, but we walked a little further along the ridge and found a quiet spot to sit down and have a sandwich. This was, I think, my favourite view in the whole of Gran Sasso. The day before we’d had lunch on the summit of Pizzo d’Intermesoli. It was a bit bleaker up there, and we were hemmed in between the adjacent summits of Monte Corvo and Corno Grande. Here on the summit of Monte Corvo there was a much greater sense of space. We looked east to other main peaks of the range. Intermesoli was almost hidden below the higher Corno Grande, but not quite. The land dropped away on the northern side, but to the south were the emerald green basins of the Valle Venaquaro and Campo Pericoli (which I had named the Gran Sasso Cwm). Each of these basins were enclosed by horseshoe ridges with many 2000m peaks along each rim. We still have a few more of these to explore. The direct route we had taken up meant that it didn’t take us long to descend again, and but for a few near misses with cyclists, it was a straightforward descent. I hope to climb Monte Corvo again sometime from the other side, completing the route we started in March.